Find Digital Converter Box Codes here. 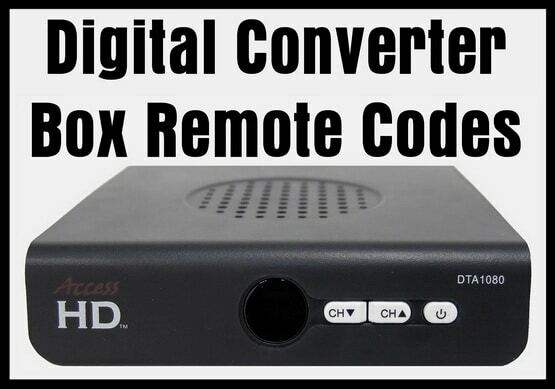 We have remote codes for most digital converter boxes. You may need either a 3, 4, or 5 digit remote code. We have a list of the brand name converter boxes and the codes to go with them. If the codes we have listed below do not work to program your remote to work with your digital converter box, leave us your request below in the comments for your code and we will add it to our list. Common 3 digit remote codes for digital converter boxes: 028, 029, 030, 031 032, 033, 034, 035, 036 and 037, 093, 132, 140, 149, 157, 161, 169, 174, 185, 186, 189, 198, 200, 207, 274. Need help? Leave a comment below and we can assist. My remote to my ematic converter box got broken. I need the codes to use a sanyo fxwk remote on my box. RDWZ Universal 3 device remote. I need a remote control code please. I am trying to program an Access HD Model DTV1080 Converter Box with a Magnavox Model MC345 universal remote, but I’m not having any progress. I need instructions please. I have a rca remote control for my TV but why don’t have a 3 number selection for a rca remote control to turn on and off the converter box ? I have the remote that came with the TV already but I can’t operate the sat-cbl-dtc part of the remote because you don’t have it listed. I have a Direct TV RC65 universal remote, and a Koramzi CB-100 converter box. Any codes would be helpful. Thanks. Onn universal remote control (0NB13AV004) codes for a Ematic converter box (AT103B). I have a 1byOne converter box. Is there a code? I have a rca box and a Toshiba ct-90164 remote. What code do i use please? Need code for Proscan PAT102-B Digital Converter Box. I’m using a GE universal remote model 33701. Thanks. Converter box is RCA STB7766C. Trying to program RCA remote RCRH02BR. Using standard codes, remote will NOT control volume – even though BOTH are RCA products. Do you have the correct code for this box? Can you specify another remote that will work correctly? I have a Sylvania, need 4 digit code for digital converter..using a universal remote. Need 4 digit code to use ge universal remote with ematic digital converter box. I have a GE universal remote that I had previously programmed to my DEGITAL STREAM DTV BOX. I changed batteries and it is no longer programmed. I need a code. I have a Craig converter digital box, (CVD506) that was working fine with my remote – Renn186, but recently the remote stop working. What should I do, replace it or not? I have a Magnavox converter box and my son messed up my universal remote. Can you tell me step by step what to do. I have an Ematic box with a GE remote, model 33712, and tried codes that listed for Ematic. Any other suggestions? I have a GE universal remote model 33712 and an Ematic converter TV box model AT103B. What is the code for the remote to operate Ematic? Trying to use a VA-405 5-in-1 Universal Remote to control an Ematic digital converter box. Code is not listed. Trying to program GE universal remote to control RCA DTA. Do I choose aux or cable? I tried the code listed and it didn’t work for either option. Thanks in advance. Please help! I have a GE universal remote and need code for Dolamee streaming box. I can’t find the 4 digit codes for an Insignia Converter Box. I have an RCA universal remote and I am trying to program my DST dtx 9900. Can I do this without a digital box remote and if so what is the code? I have a QFX CV-103 outdoor antenna with a remote control that I want to use with a GE universal remote. Can you recommend a 4 digit code that will work with it? Thanks!! i have an Ematic TV BOX AT103B & a RCA RCRN04GZ universal remote. would you happen to have the code so i can operate the ematic box with the rca remote? Do you have a code for the ViewTV AT300 Converter box? By any chance do you have the code for a Iview 3500stb converter box for a RCA universal remote? Using GE 12403 remote and need 4 digit code for Sylvania Converter Box? RCA 004RWDZ remote to be configured to a Skyworth HS8871 cable satellite receiver. Auto Code, Manual Code and Brand Code searches all do not work. Can you provide the 5 digit code? Trying to program my Ematic at103b converter box with an universal remote. I can’t find any codes. Have a RCA004RWDZ remote to be configured to a Skyworth HS8871 cable satellite receiver. Auto Code, Manual Code and Brand Code searches all do not work, would you have the 5 digit code, thanks. I have a RCA004RWDZ remote to be configured to a Skyworth HS8871 cable satellite receiver. Would you have the 5 digit code as Auto Code, Manual Code and Brand Code searches all do not work. I have a kinetic MXV4 IR remote. Need a code for Insignia NS-DXA3 converter box. I have a Supersonic ikonvert digital converter with no remote… How do i program a universal all in one remote to it? I have a universal RCA remote system link. I want to use it on my convertor box which is ‘HD atsc receiver’. The original remote is broken from the box. Do you a code for this box? What is the exact model number of your Digital Converter box? I have rca dtv converter box we lost the original remote so we bought a rca universal remote. So how do I program them? Help would be greatly appreciated. Thank you. Have misubishi tv with programmable mitsubishi remote for aux devices. I need the code to program Coby 102 converter box to this remote. I need a codes for a sansonic FT-300A converter box for a RCR804BR universal remote. Need codes for RCA converter box model DTA880. The codes on the list don’t seem to be working. Hi, have been trying to get all channels on Skyworth flat screen in kitchen, but cannot find codes for box with this tv. 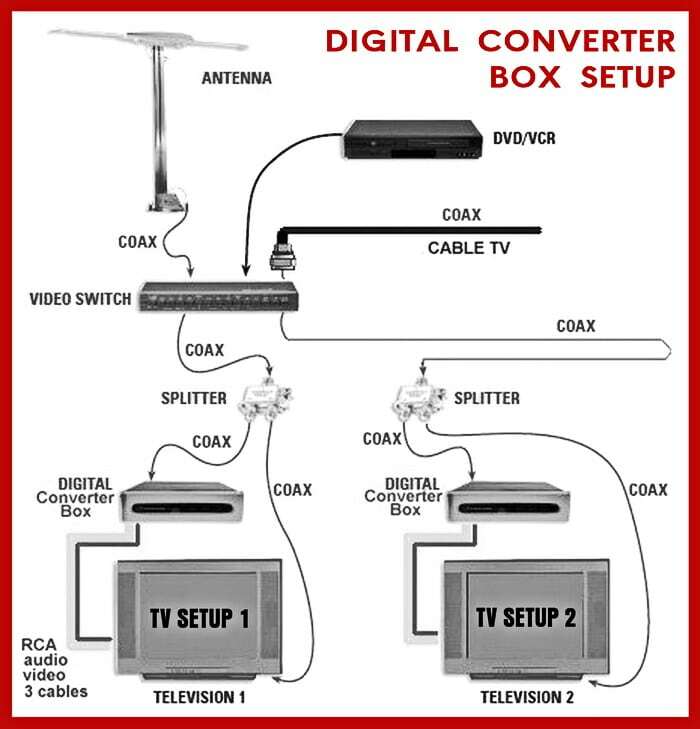 Converter box is RCA DTA880; universal remote is RCA RCR312WR. Can you please help? I am using a onn universal remote model number ONB13AV004 and i need the code for RCA DTA880 digital converter box manufactured in june 2015 please. I have a RCA Digital TV Converter + Recorder Model DTA880 that I need a code for to program a GE Universal Remote with. The remote the Converter came with is horrible so I am trying to program this Universal Remote but can’t find the number on their extensive list. Hello I have a telefunken box woth a audiosonic universal remote. How do I go about connecting the 2? Thank you! I have a Phillips universal remote and I wanted to know if I could use it to control my naxa converter box. If so can you give me some codes please. I’m having lots trouble finding the right code match for our Michley Tivax stb t12 digital tv converter. I have a ONN tv remote and I’m trying to hook it up to my Cisco cable does anyone know code for that? I have an RCA universal remote,RCR314WZ. I need the program code for a Magnavox digital converter box, model TB11OMVV9. I have an Insignia multi-directional flat hdtv antenna. It is plugged into Ant or air/cable. Can it be programmed to my Harmony 650 universal remote? I bought a RCA digital to analog converter box online, it did not come with a manual on how to program the remote, it’s an original but used and I can’t find it online, universal remotes not originals. I need the universal remote control code for Ematic Converter Box. Try these 4 digit remote control codes for the Ematic Digital Convertor Box = 0022, 0025, 0028, and 0029. Can you tell us which remote control model you are using to control the iview-3500stb converter box? If you have a Harmony remote, there is a custom IR in the database for controlling the iview-3500stb converter box. Find the FILE here if you have a Harmony remote and using it to control the iview-3500stb converter box. I have ano RCA DTA880 Digital Converter Box and I’m trying to program my Wow! Atlas 1056BO3 Universal Remote to it. If anyone could help with the 4 digit codes for that box. I have that same RCA DTA880 Converter Box that I need need a 4 digit code for a GE Universal Remote to it. I don’t see a response for your question. Post if you have found out. Hi. I have a viewtv 164 digital converter box. I would like to control it with a universal remote. I have a ViewTv AT-163 ATSC Digital Converter Box and need remotes codes for it. I’m not able to find the code for Sansonic DTV 700a for use with a GE universal remote. I need a remote code for my MediaSonic HW-150PVR HomeWorx ATSC Digital Converter Box to program my ONN Universal Remote. I have a ona16av010 remote control and need codes for a Digital Stream Converter box Model Number W0460481. Need Naxa converter box code for a universal remote replacement. I have a Nava brand digital converter box NT-52. I have a RCA universal remote (RCR504BR). I cannot find a code to work for this converter box with this remote. Can you help? I need a code for remote rcrbb04gr for RCA converter box dta800b1 none of the codes in the RCA manual. Check the RCA Digital Converter Box Remote Codes page here. I have a Digital Stream converter box. I can’t figure out how to program my Systemlink 4 RCA universal remote to it. I’ve had it programed before but lost the booklet and codes. Have you not tried all of the codes above? Let us know what codes you have tried and we will dig deeper to find one to work with your Systemlink 4 RCA universal remote to control your Digital Stream converter box. I have a digital stream dtx9950 converter box. lost the remote. I have a basic ONN or Omni 4 device Universal remote. Can I program this remote to that Digital Stream converter box if so what’s the code? I have an iview digital converter box with recording abilities but my remote has stopped working. The model # is iview300STB and i have a universal rca model remote model# rcr8048fdr 2028-t5 remote and need the codes to set up the rca to work the iview unit. Thanks in advance for any help. I’m looking for a kcpi digital converter box code for a my one remote. It’s a all in one remote. Can u help me please. I am looking for Universal remote for my QFX digital converter tv box. I have a Ematic AT103B Digital converter box and bought a GE Universal remote but I can’t seem to find a code to sync it to. Does anyone know the code I could use?? I have an Apex digital converter box and trying to program a GE universal remote it’s not got the DTV button. Is there anyway I could program this remote and if so what codes could I use? I need to know how to activate my remote to my digital tv? Please give us the Model number of your Remote Control and Your TV… and your Digital Converter Box if applicable. I have a RCA atsc converter box model dta880 made november 2015. I need the codes to the remote. I tried 5 digit codes on your list. What is the model number of the Remote Control you are using? I’m having the same problem, I have a ge universal remote I think it’s the V series. Of course the sticker came off so I’m not for sure. Did you ever find the code? If so, please let me know. Need code for ATSC (this is the brand name) digital converter and recorder. I need a code for a Qfx cv-103 converter box with usb connection for a universal control. The one that originally came with it stop working. I need a 5 digit remote code for the iView-3500STB. Thank you. I need a code for my Homeworx cable box hw180stb, it works with the Philips srp5107/27 remote. I lost my remote controller for my converter box. I am trying to use a GE universal remote and can’t get it to work. Find the make and model of your Converter Box and then match that info up with the GE universal remote owners and code manual. The codes for your converter box SHOULD be listed in the manual. If not, look online for your GE universal remote and find the most recent manual as it may have the codes listed for your converter box brand. If you cannot find the codes, tell us the make and model of your Converter box and GE remote and we can assist from there. Our Ematic TV Converter box remote keeps messing up. Is there a universal Code for it so that we can replace it with a universal remote? Is the code being erased on the box and therefore the converter box does not respond? Or is it the remote control having the issue? Is the remote code saving on the remote? Have you replaced the batteries on the remote? Try a new universal remote that works with an Ematic Converter Box. Need remote codes for the Digital Converter Box Digital Stream DTX9950. 00819, 00749, 01749, 0899, 0819, 0749, 1749, 0354, 0465, or 0864. I have a KCPI digital converter box using an older or talking universal COMCAST remote. I Have A QFX converter Box I Can’t Seem To Find The Codes Anywhere For My RCA Remote Controller… Why Is That? I need to program my Insignia remote to my Ematic converter box. I am trying to program an RCA ATSC converter box attached to an RCA XL 100 XS STEREO commercial skip TV with an ONN universal remote. I realize that my equipment may be old but it still works. I have a one remote and I’m having trouble finding a code that will work to program and use for my TEA converter box. I have a GE 23333 converter box what remote will make all the functions work? I am trying to program a Digicrystal Digital Converter box into a Chunghop L366 Universal Remote Control….. are there codes for this? I need code to NAXA digital converter box so I can program it to a ONN universal remote control. I have a Iview 32000stb multimedia digital converter box. I have a older JVC TV with a universal remote from Philips. I can’t seem to find a code for any iview products on the site. I need to know how to program my Phillips universal remote to my RCA digital converter box? I need directions and codes to program a rca digital box remote to a Magnavox digital box. I am having problems programming my DISH remote to my Zenith dtt901 digital converter box. I tried the 1750 and the device light blinks 3x but no functions operate. I have an RCA digital converter box and none of the codes are working. I’ve gone to multiple websites and every code I’ve tried will not work for all three brand new universal remotes I bought to make it work. I have the book to my remotes and no codes in the books are working either. I had no problem setting up everything else to my remote just cannot get the digital converter box to work. I have same issue. Even the original RCA remote won’t work. Need a remote code for a Naxa Digital television converter box. I have a RCA converter box and I’m trying to activate a universal remote to it. I have a RCA DTA880 TV CONVERTER BOX FOR HD. I have a URC 8820 CISCO REMOTE FROM COX CABLE which remote codes should I use and how can I program the cox remote to work my converter box. I need the code for a Iview 3200 converter box. My remote came broken when i bought it! There are no remote codes in the database just yet for the Iview 3200 converter box. Here is a link to buy the exact universal remote for the 3200. It is only 15 US dollars. I have a Zinwell converter box and the remote is lost. Bought a Phillips universal remote. How can I program it to the convert box? I tried putting a Zinwell code remote in when setting up, but didn’t work. Which device button do I push when entering code? I have a GE 24927 universal remote. I have a Magnavox TB110MW9 converter box. I can not get the universal to control the box. Also is this the button for cable or satellite? If there is no power button, the converter box is in standby mode when plugged in. So….. plug in the converter box and make sure all the wires are connected. -Place your TV on channel 3. -Point your GE universal remote at the converter box, press and hold the setup button until the red light remains lit, then press and release the DVR/AUX button. -The red light will blink once. -Enter 0581 as the code, then press Power and the Converter box will turn on and your channels will come up. I picked up a Ematic Digital Converter Box model AT103B. We use a very Big Button remote to see the functions and numbers. I can’t find a code to work with the universal Big Button remote to work with Ematic Digital Converter Box. What is the model number of the big button remote control?